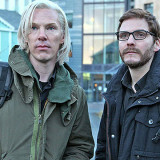 Benedict Cumberbatch’s portrayal of the enigmatic Julian Assange is brilliant. The Fifth Estate opens with an homage to the evolution of news media. It shows some truly earth-shattering events being reported via print, radio and television and demonstrates how they led up to WikiLeaks’ preferred delivery system, the web. It sets the stage, building the drama and the import of the events that follow. Unfortunately, as amazing as Benedict Cumberbatch’s portrayal of the enigmatic Julian Assange is and as entwined as the evolution of WikiLeaks may have been in shaping recent major world news, the events that follow fall incredibly flat. The film shows how Assange, with a strong will and very limited resources, launched WikiLeaks as an idealistic whistleblower platform. However, over time, the prophet became his own problem—guarding his own secrets, alienating followers and risking sources’ anonymity. With the founder’s ego and paranoia seemingly overriding the organization’s (supposed) original altruistic intention, it’s unclear whether Assange is a much maligned antihero or a misguided and manipulative villain. Ultimately, the film tries a bit too hard to be balanced on that judgment, sharing sad stories of his childhood and long, poorly written speeches about the importance of the cyber-revolution he launched with the help of trusted computer and marketing guru Daniel Berg (portrayed capably by Rush actor, Daniel Brühl). An off-putting, internalized man who uploads documents to the internet is hardly titillating screen fodder. But surreal depictions of Daniel’s thoughts don’t successfully convey the excitement of hacking. And a subplot about two U.S. government officials (Stanley Tucci and Laura Linney) impacted by Assange doesn’t go anywhere. While The Social Network successfully chronicled the story of a reserved, less-than-lovable character using using technology in new and exciting ways, The Fifth Estate struggles to bring that same thrill and drama to the screen.